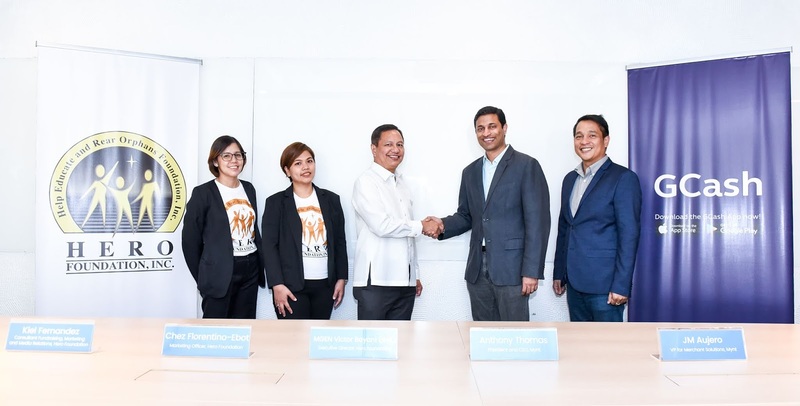 GCash, the Philippines’ #1 mobile wallet sealed its partnership with Hero Foundation Inc. - a non-governmental organization (NGO) in the Philippines which main advocacy is to help orphans of our fallen and incapacitated military men in the line of duty. This partnership is an initiative driven by shared vision of GCash and Hero Foundation that families depending on fallen brave men who faced tragic events or at worst died serving the country are not left behind. It is a reality that most of the dependents of our fallen military heroes suffer from hunger, inability to sustain basic needs, lack of money to send the children to school, unavailability of jobs for their spouses, and other misfortunes brought by incapacity of the family’s breadwinner. Hero Foundation as an institution has reached significant number of fallen military heroes’ orphans by providing them opportunity to have the proper education. Hero Foundation, sponsors scholarship grants to these orphans as a way of giving back to the fallen heroes we have today. Bearing these realities in mind, GCash, has explored to open a partnership with Hero Foundation. The country’s #1 mobile wallet has provided Hero Foundation and our fellow countrymen who support the cause a fast, secure, and convenient way of bringing something back to orphans of military men who died in line of duty. Using the Quick Response (QR) Code technology donations can now be made digitally. The donation boxes of HERO Foundation are strategically located at the major malls in Metro Manila and throughout the country and will also be assigned their specific QR codes. “Since HERO Foundation’s inception in 1988, it has been actively supporting the families of our military personnel killed or totally incapacitated in the line of duty. We only are able to do this through the generosity and trust of individuals and corporations. Through this partnership with GCash, being a HERO to our heroes' children is made easier and more convenient. It also is a way to honor the sacrifices of our military by ensuring the children they leave behind still have a chance to a brighter future”, said Hero Foundation Inc., Executive Director, MGen Victor V. Bayani (Ret). "We believe in what Hero Foundation is advocating for and we want to be part of their journey of helping the families of our military heroes. GCash will enable the foundation to accept donations via the QR technology and soon, through our App via the online bills payment. We hope this will increase their reach and help in their advocacy. This is very much aligned with our drive for financial inclusion in the country and our campaign for #GCashForGood,” as shared by Mynt’s CEO, Anthony Thomas. Mynt is the company that operates GCash.